This is a gluten free, dairy free and easy to make chocolate treat that also contain a bit of protein. Use pretty tinfoil moulds in different colours to give this easy to make treat a elegant look or to suit any special occasion or holiday. Melt chocolate in a water bath or using your preferred method. Add puffed quinoa, mix evenly. 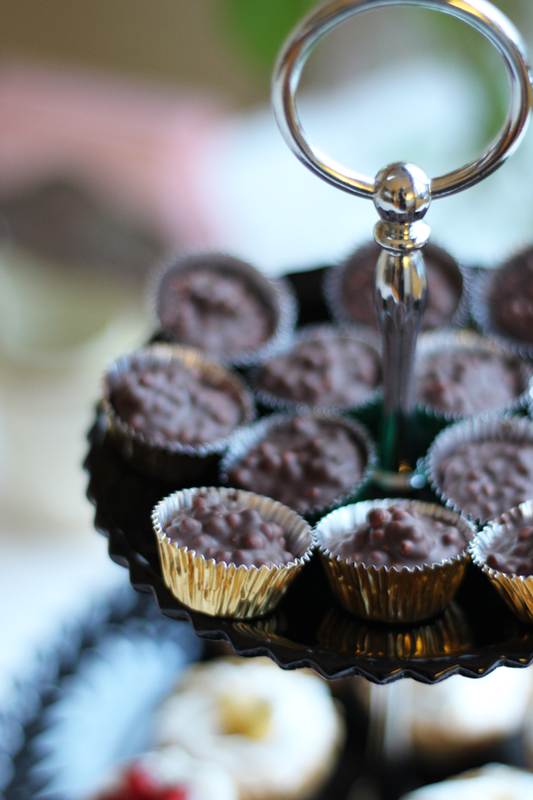 Use a teaspoon to add the chocolate mixture to each mould/cup. Let set in room temperature. Hi – can you please advise how many grams of puffed quinoa = 1 DL (or even how many cups?). I’ve not come across this measurement before… thanks! They look amazing! When I created this recipe I used DL, it’s easiest to use a spoon or another measuring tool using this recipe. I would advice to translate 1 DL to US tablespoons which is then approximately 6,7 US tablespoons. I hope this helps and I’d love to see your version ot these yummy chocolates! :) Please tag me on IG, FAB or Twitter when you’ve tried the recipe!